You’re already realizing the benefits of Salesforce.com for sales, marketing and customer service. Maximize the value of your Salesforce system by upgrading from your legacy accounting software and connecting it with the best-of-breed cloud financial solution, Intacct. The preferred provider for the AICPA, Intacct offers web based financial management software to improve your organization’s performance. Adopting a best-of-breed cloud software approach allows CFOs the ability to roll out greater functionality quickly with less risk and a lower cost than software suites. With a robust team of Intacct- and Salesforce-certified consultants, Armanino is your partner for success for cloud solutions. Make the move to Intacct today. Learn more. 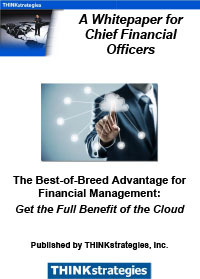 Discover the advantages a best in breed cloud financials software package offers.